In 1794, the São José, a Portuguese slave ship, was wrecked near the Cape of Good Hope in South Africa. Destined for Brazil, the ship was carrying more than 400 slaves from Mozambique when it struck a rock and began to sink. The crew and some of those enslaved were able to make it safely to shore, but tragically, more than half of the enslaved people aboard died in the rough waters. The São José left Lisbon April 27, 1794, to purchase slaves in Mozambique, with the intent to continue on to Brazil. The Cape of Good Hope in South Africa had long been supplied with enslaved people from parts of East Africa, but beginning in the 1790s, East Africa also became a significant source of slaves for the Brazilian sugar plantations. The São José was one of the earliest voyages of the slave trade between Mozambique and Brazil, a massive trade in human beings, which continued well into the 19th century. More than 400,000 East Africans are estimated to have made the journey between 1800 and 1865, transported in inhumane conditions in voyages that often took two to three months; many did not survive the trip. For many years Cape Town prospered as a way station for this trade before ships began their long trans-Atlantic journey. SWP, a collaborative effort between the Smithsonian’s National Museum of African American History and Culture, Iziko Museums, the South African Heritage Resources Agency, the George Washington University and a core group of international partners, uses slave shipwrecks to investigate the impact of the slave trade on world history. The still-developing story of the São José represents the work of researchers and scholars from Mozambique, South Africa, Portugal, Brazil and the United States. SWP has now amassed enough information in Cape Town, Mozambique, Portugal and Brazil to tell a story of the ship owners, captains and voyage of the São José. But what is most important is what can now be said about the enslaved Africans who perished in that shipwreck. The São José is the first known shipwreck to be identified, studied and excavated that foundered with enslaved Africans on board. The identification of the São José ship off the coast of South Africa provides an unparalleled opportunity for SWP to diligently excavate, conserve and prepare authentic objects of the trans-Atlantic slave voyage. The São José is also highly significant because it represents one of the earliest, experimental voyages that brought East Africans into the trans-Atlantic slave trade. The selection of artifacts retrieved from the São José loaned by Iziko Museums and the government of South Africa for display at the inauguration of the National Museum of African American History and Culture will provide visitors with uniquely powerful and authentic symbols of the Middle Passage. These objects and the story they tell will provide tangible and intimate touchstones through which people from around the world will be able to reflect upon and grapple with a trade that spanned the globe, shaped world history and through which millions tragically lost their lives. April 27, 1794—The São José, a ship owned by Antonio Perreira and captained by his brother, Manuel Joao Perreira, left Lisbon for Mozambique with more than 1,400 iron ballast bars in its cargo. Seeking new markets, it is one of the first attempts by European slave traders to bring East Africa into the broader trans-Atlantic West African trade. Dec. 3, 1794—São José, laden with more than 400 captive Mozambicans likely from the interior of the country, set out for its destination: Maranhao, Brazil. Dec. 27, 1794—Caught in variable winds and swells off the coast of Cape Town, the São José ran into submerged rocks in Camps Bay about 100 meters (328 feet) from shore. A rescue was attempted, and the captain, crew and approximately half of those enslaved were saved. The remaining Mozambican captives perished in the waves. Dec. 29, 1794—The captain submitted his official testimony before court, describing the wrecking incident and accounting for the loss of property, including humans. Surviving Mozambicans were resold into slavery in the Western Cape. Apart from the court documents and scant reports throughout the years, the incident of the São José and the fate of those 200 enslaved Mozambicans passes out of public memory. After 1794—The Portuguese family who owned and operated the São José continued their international slave trade and make several complete voyages bringing captive Mozambicans to Northeast Brazil where they are sold into slavery on plantations in and near Maranhao. 1980s—Treasure hunters discovered the wreck of the São José and mistakenly identified it as the wreck of an earlier Dutch vessel. 2010–2011—SWP discovered the captain’s account of the wrecking of the São José in the Cape archives. Combined with the treasure hunters’ report from the 1980s, new interest developed on the site. Copper fastenings and copper sheathing indicated a wreck of a later period, and iron ballast—often found on slave ships and other ships as a means of stabilizing the vessel—was found on the wreck. 2012–2013—SWP uncovered an archival document in Portugal stating that the São José had loaded iron ballast before she departed for Mozambique, further confirming the site as the São José wreck. The SWP later uncovered a second document in Mozambique confirming the sale of a Mozambican on to the São José. Full documentation of the wreck site begins in 2013. Complementary archival work continues at an advanced stage and is supplemented by additional work in Europe, Brazil and Mozambique. 2014–2015—Some of the first artifacts are brought above water through a targeted retrieval process according to the best archaeological and preservation practices. Using CT scan technology because of the fragility of the site, SWP identified the remains of shackles on the wreck site, a difficult undertaking, as extreme iron corrosion had occurred. June 2, 2015—Soil from Mozambique is deposited on São José wreck site during a solemn memorial ceremony honoring those who lost their lives or were sold into slavery and bringing their story back into public memory. 2015 and beyond—Full archaeological documentation of the shipwreck site continues. 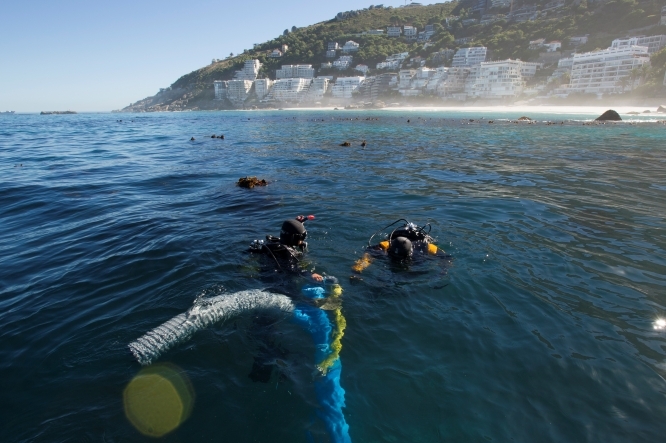 Initial archaeological surveys and continued archival and community-based research begins tracking origins of slaves and sites in Mozambique, possible fate of survivors in Cape Town and the descendants of successive voyages in Brazil designed to trace a line between points of origin in Africa, the wreck site and subsequent points of destination in the Americas.